Crocheter's, your lives are about to get a little bit easier. When it comes to crocheting on the go, there are multiple problems that can arise. Misplacing your yarn and/or hook, getting said yarn tangled or dirty by rolling out of your bag and onto the floor, to name just a few. The ArtBin Yarn Drum is the solution for all your crocheting on-the-go woes. This 12" round X 12 ¾" high tote is lightweight and easy to carry around. With an adjustable shoulder strap (with convenient zipper pocket for your hooks) and a easy grip handle along the top, you have multiple ways of carrying it around. Plus, it has tons of great storage features! 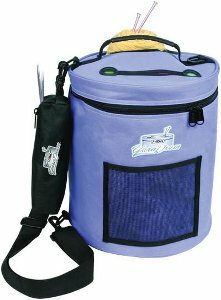 The ArtBin Yarn Drum can carry up to eight skeins of yarn, with a special zipper pocket on the strap for your hooks. Plus, you can easily remove yarn through the lid while you crochet, which means no more balls of yarn rolling across the ground or getting tangled. The ArtBin Yarn Drum is a must-have tote for any crocheter planning to craft on-the-go. House all of your crochet necessities in one easy place with the help of this fabulous tote! It comes in a variety of colors: periwinkle, raspberry, and pink. Buy your ArtBin Yarn Drum at CutRateCrafts.com! And also check out this video for more information on the ArtBin Yarn Drum! I have this bag and it is roomy. I loved the idea that I could take my current project with me and the side case holds my needles and accessories. My one complaint is that when the skein gets smaller it comes out of the top. Otherwise well worth the purchase.